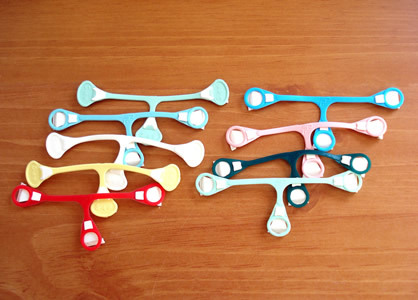 Eliminate the need for diaper pins with Snappi® Diaper Fasteners. The Snappi® has grips that hook into the diaper fabric to ensure a snug fitting diaper with enough natural movement for baby. It works best with cloth diapers with a loose enough weave for the snappi to hook into such as cotton prefolds and terry cloth diapers. *Ordering just Snappi®'s? We'll ship parcel post to save you shipping! 1. STRETCH the Snappi® fastener before its first use. The stretching triggers the 'memory' of the Snappi® to return to its original size and in so doing, pulls the diaper together to the middle to allow for a snug fit. As you do this you should feel how the material 'softens' or gets more elastic. Stretch each leg. 3. Do not cut your Snappi®. This could create weak spots in your Snappi®. 4. INSPECT your Snappi® before each use and discontinue use immediately if there is any sign of cracking, tearing, breakage or wear of the teeth or any other parts. By following these instructions, the Snappi® should be secure, the diaper will fit snugly and the baby should not be able to undo it. 5. Do not use your Snappi® for longer than 6 months. 6. Do not leave your Snappi® lying in the sun. It is not UV resistant and this can reduce the effectiveness of the Snappi®. 7. The best way to clean to your Snappi® is to wash in warm soapy water. Do not launder them with diapers in the washer as this may weaken the grip attachment.